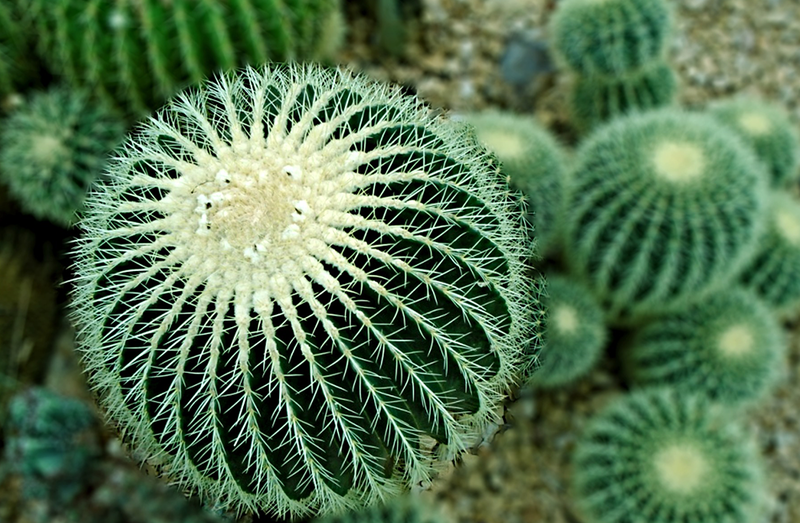 There’s no denying that cacti are some of the coolest plants out there. They come in all kinds of peculiar shapes and sizes – some miniature and some 40 feet tall! You might assume these hardy succulents don’t require much care since they’re able to tough it out in the desert, but every cactus is a little different, so there are a few things to keep in mind when caring for your own. 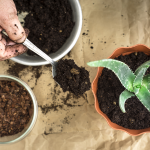 Since cacti are accustomed to the hot and sandy conditions of the desert (and not the cold and wet conditions of Alberta), you’re going to want to make sure your soil has excellent drainage. There are special soil blends available made especially for cacti, but you can also just mix some perlite with regular potting soil. Ideally, you’ll also want to find a pot that has some good draining holes in it. If your pot is sealed, it’s trickier, but not impossible to protect your cactus from splitting, or even worse: root rot. Just make sure you water it less and always check that the soil has dried out before you water it again. 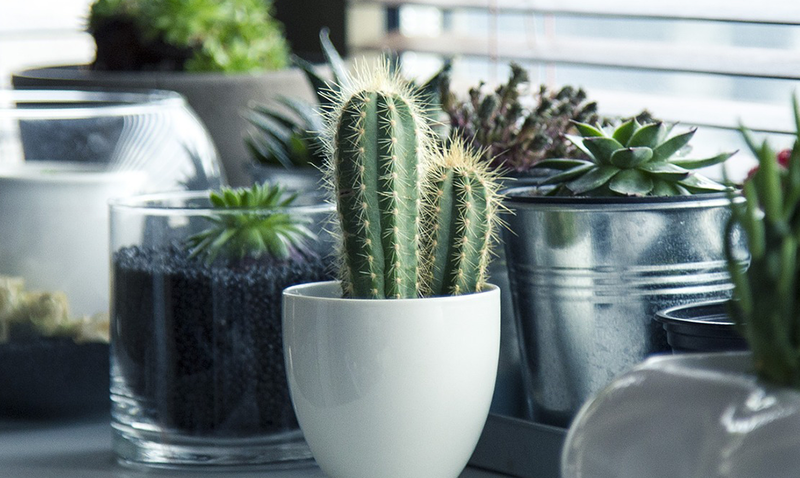 Cacti typically like lots of sunlight, so placing them on a windowsill is your best bet. 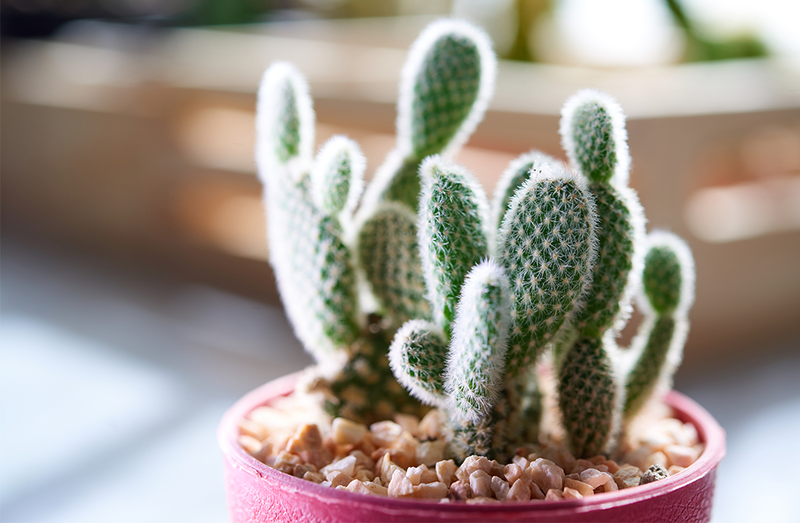 Keep in mind, cacti tend to lean towards the side that the sun is on, so if you don’t want to end up with a lopsided cactus, rotate your cactus 90° every month. Sometimes intense sunlight can be a bit much for a cactus and they’ll start to bleach, creating white, yellow, or orange spots. If this happens, move it to a slightly shadier spot. If the cactus is stretching thin at the top or is starting to look weak, it’s probably not getting enough sun. Instead of immediately moving it to a sunnier window, inch it closer day by day so it doesn’t get shocked by the change. 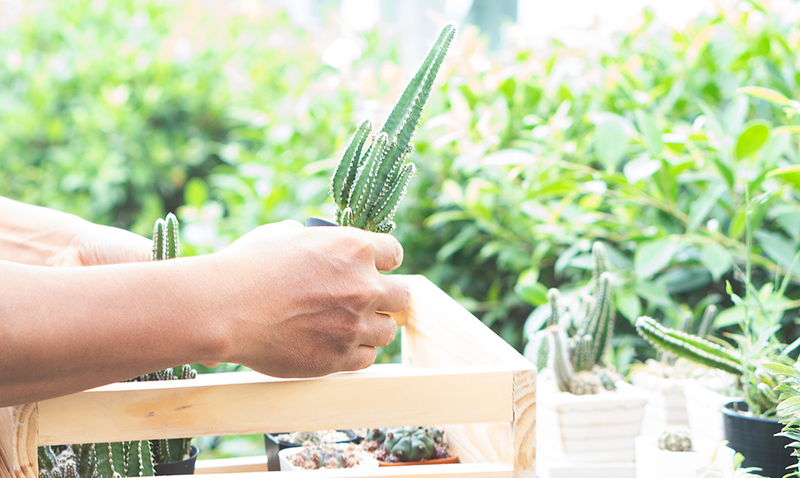 At the start of each spring, repot your cactus into a slightly bigger pot than before. Pick off any dead bits near the roots, then firmly pack down the fresh soil around the base. After you transplant it, you’ll want to hold off on watering for a couple of weeks. Keep it away from super bright sunlight during this time, then transition it back to the windowsill over a couple of days. During the warmer spring and summer months, water your cactus with a little liquid 10-10-10 fertilizer mixed into the water. 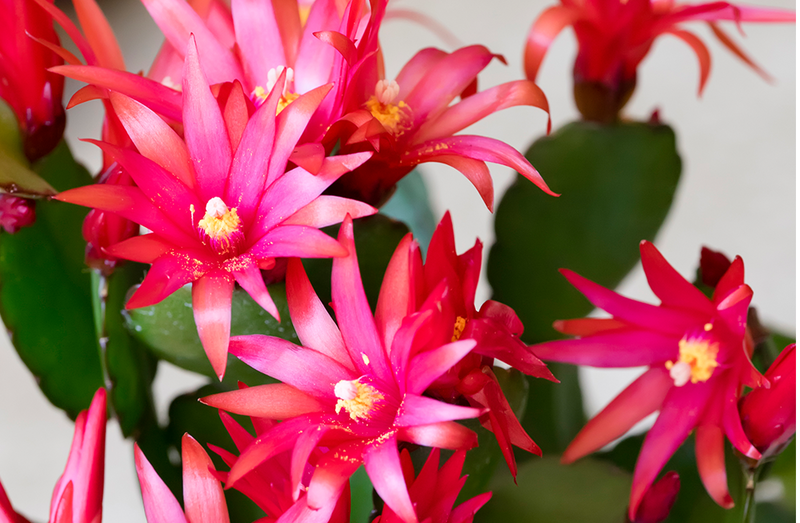 Summertime is the natural growing season for cacti, but if you want to ensure that your cactus produces beautiful blooms, you’ll have to give it a chance to rest and build up energy by easing it into dormancy. This period usually spans from mid-autumn until the end of winter. 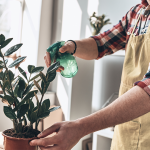 All you have to do is move the plant to a shadier spot in the house, stop fertilizing it, and cut back on watering to about once a month. 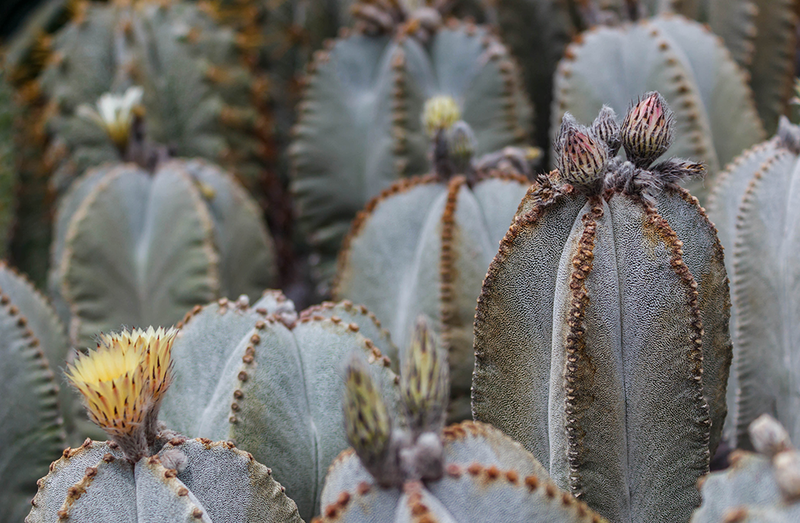 Obviously, you aren’t going to want a 40-foot cactus in your house, but thankfully there are tons of ornamental varieties that are the perfect size for indoors. Just make sure you place them in a spot that you aren’t going to lean or bump into! Saguaro Cactus [Carnegiea gigantea]: These tall boys are the ones you see out in the desert reaching colossal heights, but they’re so slow to grow that you can easily keep a small one in the house. They can even live for up to 200 years! Saguaros like to be watered about once a month. Old Lady Cactus [Mammillaria hahniana]: This one is kind of adorable and hilarious. 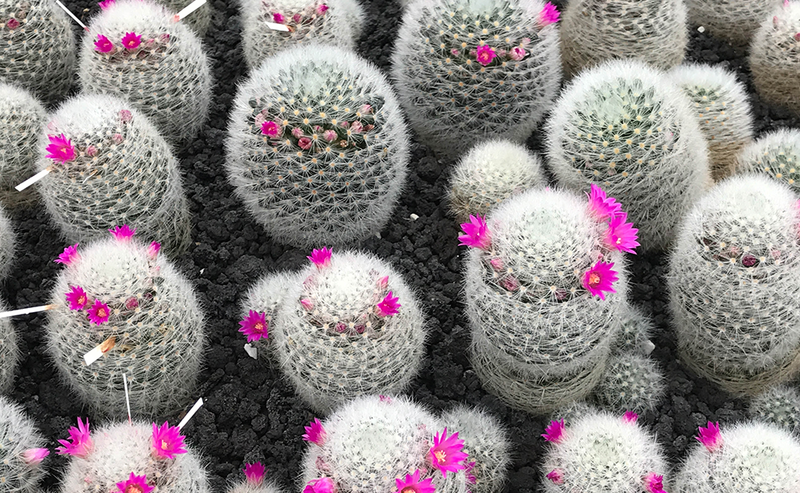 As the name would suggest, this round cactus is covered in fluffy, white hairs like the top of your granny’s head and wears a crown of tiny bright pink flowers. Water it once every two weeks in the summer, then once a month in the winter. Bunny-Ears Cactus [Opuntia microdasys]: This knobbly Mexican cactus reaches heights of 2-3 feet, so it’s a reasonably-sized houseplant. Water it every three weeks or so, expose it to partial sunlight, and in summer you’ll see some white blooms and purple fruits! Star Cactus [Astrophytum asterias]: This popular variety is kind of like a curvy octagon, with a yellow blossom that sits on top. It’s on the smaller side, usually ranging somewhere between 2 and 6 inches in height. 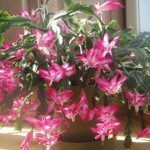 Thanksgiving Cactus [Schlumbergera]: This one resembles a typical hanging basket houseplant more than your typical tall sturdy cactus. 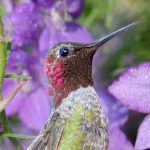 Depending on the kind you get, it can produce winter flowers in yellow, pink, purple, white, or the most festive option, red. It’s a little different than other cacti, because it’s used to the humid climate of Brazil, so it prefers weekly watering and a light misting every so often. 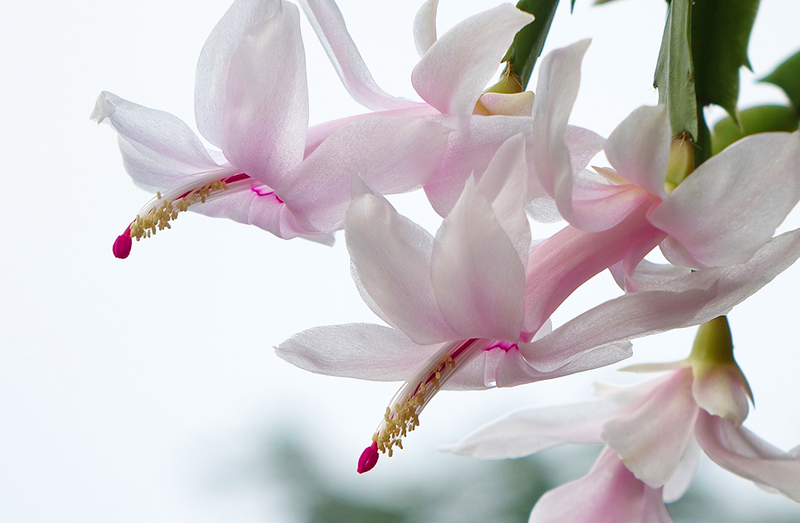 Easter Cactus [Hatiora gaertneri]: This guy is pretty similar to the Thanksgiving cactus and prefers humidity, but instead of blooming in the winter, you’ll see bright blossoms in the early spring. Barrel Cactus [Echinocactus grusonii]: This tiny, spiny round cactus looks great on a bookshelf or as part of a coffee table centrepiece. Just make sure it gets lots of sun! Water it every 3-5 weeks in the summer and barely at all in the winter. 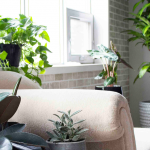 If you want a cool houseplant that really stands out, pick up a cactus for yourself and find it a sunny spot in your house. Let’s be honest, this plant is pretty badass, so it’s sure to bring a little attitude to your home aesthetic.